This Twitter account is part of an artistic and literary performance in social media, consisting of short poetic snippets of Surrealism, the absurd, textual, photographic, and video entries, dark humor, and links to the other component of the project, a Tumblr site aptly URL’d http://lazenby.tumblr.com (depicted below). Clearly the Tumblr site allows for more expansive development of ideas and more traditionally formatted poetry than the Twitter site, but it is clear that a single voice informs both output streams. Note that the performance extends to the titles of both sites: the Twitter one is “name” (since it’s considered to be a person) and the Tumblr one is an address in New York City— of whom or what, I do not know. A clearer indication is the account and URLs use of George Lazenby, an actor famous for playing James Bond only once—in the 1969 film On Her Majesty’s Secret Service— and then resigning from the first and most lucrative role in a career that faded into obscurity. Is the author of this social media performance George Lazenby? If he is, he has not sought to “verify” the authenticity of his account, which according to Roger Ebert actually suggests it might be. 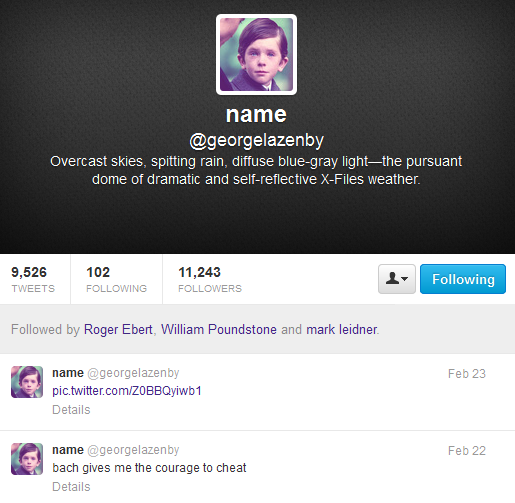 One of the smartest Tweeters is @georgelazenby, whether or not he is the George Lazenby. I think there’s a good chance he might be, because he doesn’t make any such claim in his bio. I prefer to leave the work unattributed until I know for sure, recognizing that doubts about identity are consistent with the performance. This work thrives in that space between perception and reality, where human minds seek to make sense of the world, cutting it down to manageable size through rationality. And @georgelazenby is there to destabilize those efforts on your Tumblr or Twitter stream, if you subscribe to the feed. Note: Read William Poundstone’s conceptual poem “@georgelazenby: How Goes the Enemy?” and the ELMCIP Knowledge Base entry for this work.